Bayern got the decisive goal as United played the last 40 minutes with 10 men. United led 3-1 on the night and 4-3 on aggregate when Rafael was sent off for tugging back Franck Ribery, and Bayern then went on to win a pulsating tie on away goals thanks to Arjen Robben's spectacular volley. 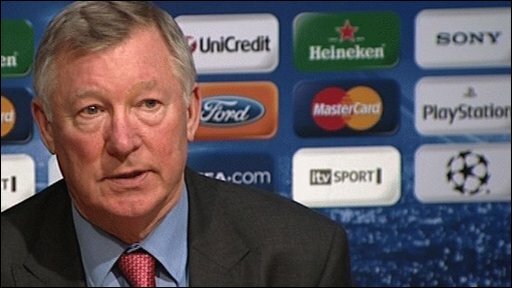 Ferguson insisted that the dismissal changed the course of the game, saying: "There is no doubt about it. They were never getting through that tie, with 11 men we had no problem." And asked later whether he stood by his contention that the Bayern players had been wrong to protest about Rafael's challenge on Ribery, Ferguson confirmed: "Yes. "It was typical professionalism in a way but they saw the opportunity and they almost forced the referee to get the card out - the referee wasn't going to do anything. But we've seen it before from teams like that. "The Bayern players got him sent off, there's no doubt about that. It was only a little tug of the lad 35 yards from goal, they're not even a goal threat at that point. "[Rafael's] inexperienced and sometimes, like that, the inexperience can show itself. But he had a marvellous performance, the boy, and it's a tragedy for him. But I think we were very unlucky tonight." United had seemingly taken control of the tie with two goals from Darron Gibson and Nani, who went on to score their third of the night before Ivica Olic reduced the deficit. Bayern dominated after Rafael had been sent off but Ferguson felt his side still deserved to go through. "We played better today than they did in their own ground," he added. "Without the extra man they made the ball work and I thought we defended very well, it's taken an exceptional strike to settle the tie. Former Chelsea winger Robben settled the tie with a superb volley from the edge of the box that came to him direct from a corner. "It was a fantastic strike," Ferguson admitted. "But we had no-one on the edge of the box and that was down to the fact that Nani's position was to be there, but the fact that we played him through the middle after the sending off meant we were short of that man." Ferguson was also unhappy about some of the challenges made on striker Wayne Rooney, who was a surprise starter after limping out of the first leg with an ankle injury and managed only 55 minutes on Wednesday night. 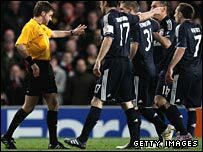 "He had a couple of challenges and I don't think he got any protection (from the referee)," said Ferguson. Bayern manager Louis van Gaal disagreed with Ferguson's claim that the Bayern players had a part in Rafael's dismissal, saying: "I thought England was a country of fair play and I don't think that is fair. "I don't share Sir Alex's opinion. Part of being a player is control. Every player must know if you pick up one yellow card, a second one means a sending off. "I certainly believe it was a yellow card offence and that is down to the player. "Did the red card change the game? We shall never know. It is easy to say that after a loss. This game shall not be played again. I think [Ferguson] is just disappointed." The sending off was, however, deemed a key moment in the game by Bayern's honorary president and former World Cup winner Franz Beckenbauer. "We were asleep at the start and Man U were superior in every aspect," he said. "At 3-0, I would not have bet even a cent on Bayern. "But they turned it around magnificently. Two moments were decisive: the goal for 3-1 from Olic just before the break and then Rafael's red card. "Bayern then played with composure, let the ball roll and Robben then scored a dream goal. "It was one of the most beautiful defeats in Bayern Munich's history."